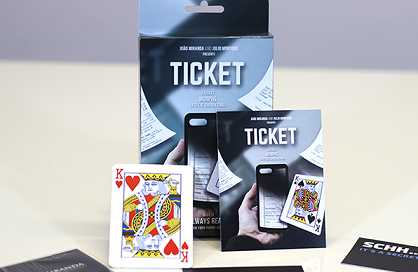 Welcome to Ticket, another amazing creation of João Miranda and Julio Montoro. This is a super visual effect that happens in a blink, and looks like real magic! In this effect, a card is chosen and lost in the deck. The magician then states that he correctly predicted the chosen card, and that he kept the prediction inside his phone case. The magician removes the phone from the case, and... nothing to be seen... there is only a bill, some papers, and a ticket. SUDDENLY the ticket visibly morphs into the chosen card! The audience will go crazy when they see this transformation - it really looks like a TV special effect! - The trick is ALWAYS ready to go inside your phone case.